A premiere sensual aphrodisiac. It is comforting and relaxing. As a semi-solid concentrate, this oleoresin is much thicker than regular essential oils. It will not dissolve easily into carrier oils but has a wonderful scent for inhalation! There is just something about the scent of Vanilla. Some people tend to focus on the pleasant childhood memories associated with the smell of vanilla, its comforting milky warmth. 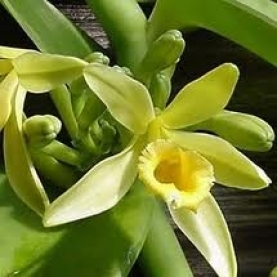 Vanilla is sweet, reminiscent of childhood, gentle, warm and welcoming.